After dropping its Great Basin Conference league opener 46-13 to Minico in Rupert Friday night, the Wood River High School varsity football team is looking ahead to another league road game Friday, Oct. 5 against the Twin Falls Bruins. Wood River (1-3, 0-1) and Twin Falls (1-4, 0-1) seem equally matched by record, but the Bruins have lost two straight games by a total of 10 points including last Friday’s 39-36 loss at Jerome (3-3, 2-0). It was a game when Twin Falls led 29-12 and Jerome rallied. Also, Twin Falls won the GBC league title in 2009 and has finished second to Minico the past two years—and Wood River has never beaten the Bruins losing 45-0 and 17-14 at home, and 34-14 in Twin Falls. Wood River, averaging 9.8 ppg on offense, continues to struggle on the attack. But senior running back Ian Keys rushed for over 100 yards at Minico and scored the second Wolverine touchdown of the fourth quarter on an 18-yard run. And leading scorer KJ Savaria tallied the first score. Minico (3-2, 2-0) has won six GBC championships in seven years and boasts a 29-3 league mark since 2004. The Spartans rushed for nearly 300 yards against a Wolverine defense that lost senior Drew Barsch (knee) to injury and trailed 25-0 at half, and 39-0 after three. 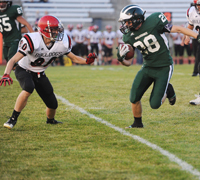 Wood River’s junior varsity hosts Twin Falls Thursday, Oct. 4 at 6:30 p.m. at Phil Homer Field in Hailey.